The Congress party on Wednesday said that Prime Minister Narendra Modi compromised India's security and sovereignty in the United States by keeping mum after Jammu and Kashmir was termed as 'Indian Administrated Jammu and Kashmir' by the U.S. government. 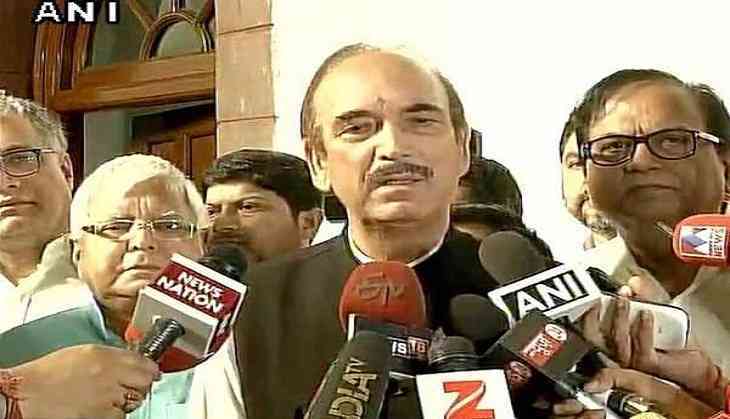 Addressing a press conference here, senior Congress leader Ghulam Nabi Azad said that "it is shocking that the U.S. government's statement on terror outfit head of Hizb-ul-Mujahideen chief Syed Salahuddin, refers to Jammu and Kashmir as 'Indian Administrated Kashmir'. This is part of the order and not just reference. This is total compromise with India's national security and sovereignty." The Congress leader trained his guns at the Prime Minister, the Bharatiya Janata Party (BJP) and other cabinet ministers over the issue. "Why has Prime Minister of India not protested despite being on US soil? Why our foreign, defence, home, and Information & Broadcasting ministers have not issued a single statement or apology? Why is the 'nationalist' BJP silent? Is it not total sellout of the national interest?" Azad questioned. The Congress leader took a dig at BJP and PM Modi's nationalism plank and said, "Modi ji and the BJP preach pseudo nationalism everyday and the country would expect to know that why has this government accepted the phrase 'Indian administrated Kashmir'?" He asserted that " Jammu and Kashmir was, is, and shall remain an integral part of India. For, Narendra Modi ji and his party this can be a subject of political expediency to keep silent the Indian nation but the Indian National Congress or other secular parties will never be silent on the issue." Azad said the BJP and the government have been boasting about the US' order on Salahuddin as if this was the only government that would have done it. "Due to the efforts of the Congress led United Progressive Alliance (UPA) government; in June 2006, the U.S. imposed heavy sanctions on India's most wanted terrorist Dawood Ibrahim. On August 6, 2010, Pakistan based Harkat-ul-Jihad al-Islami (Huji) was declared a terrorist organization, On September 15, 2011, another Pakistan based Indian Mujahidin was declared as terror organization, and on April 3, 2012, the US had put bounty of USD 10 million on Lashkar-e-Taiba chief Hafiz Sayeed for his role in Mumbai blasts," Azad said. The US State Department has designated Syed Salahuddin as a Specially Designated Global Terrorist.